I always find it a great challenge to find a hotel with rooms that can accommodate a family of 6. 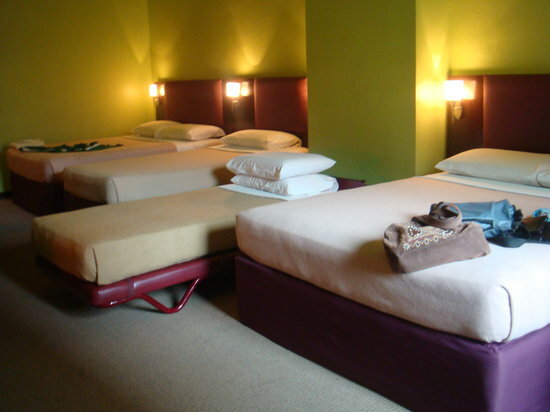 Maximum capacity in most hotel rooms are usually 4 persons. I suppose most hotels presume that a family usually consists only of a couple with 2 kids. So most family rooms only have a maximum capacity of 4. In my experience, it's always cheapest to get 1 family room good for 6 rather than to get 3 rooms good for 2 persons, or 2 rooms good for 3 persons, etc. So I was so happy to find Strand Hotel. 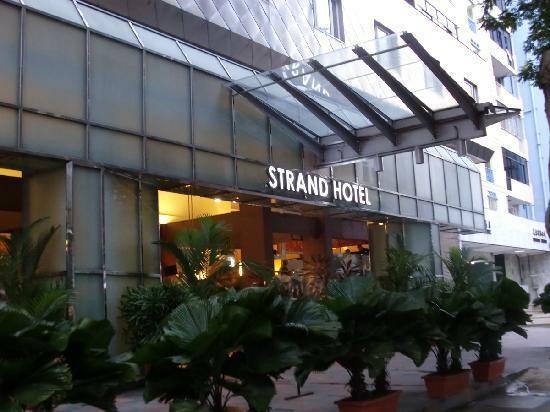 We just arrived from Singapore and this is my review of Strand Hotel. 1. The hotel is just across Kopitiam food court and 7 eleven. Updated August 2015: The Kopitiam food court across Strand Hotel is already closed. There are no plans for reopening it. Both Kopitiam and 7 eleven are open 24 hours a day so anytime you become hungry you can just walk across and buy food. At 7 eleven, you can also buy ezlink cards for use at the MRT, the bus and Sentosa express. If you have remaining load in your ezlink cards before leaving Singapore, you can use it the remaining balance to purchase products at 7 eleven. My tip: Make sure to make the purchase using the ezlink card after 7am. That's the only time the 7 eleven store allowed to use the ezlink card. 3. The hotel is very near the hippo tour bus stop. If you decide to take the Hippo Tour hop-on hop-off, you can take the yellow line that stops at the bus stop along Bras Basah, beside the Rendezvous hotel. The Rendezvous hotel is beside Strand Hotel. You can buy the ticket in the bus when you hop on the yellow line bus. My tip: Do the whole route of both the yellow and red line first. First Suggestion: Ride the yellow line at the bus stop beside Rendezvous hotel, get off at Suntec. Ride the hippo tour red line at Suntec and do the whole route, and get off at Suntec. Ride the hippo tour yellow line at Suntec and get off at the bus stop beside Rendezvous hotel. You're done. You have toured Singapore without effort. Second Suggestion: go directly to Suntec City to start the tour. What you do is to walk to Bras Basah Station, take the MRT circle (yellow) line going to Harbour Front and get off at the next stop, which is Esplanade. The Esplanade station is at Tower 5 where the Hippo Tour Desk is located. Take note that the big, white structure with a dome that you see when you're outside the hotel and along Bencoolen Street is the National Museum of Singapore. It's very short walking distance from the hotel. At the National Museum, we were able to see the original painting of Starry Night of Vincent Van Gogh and at least 4 Monets, 3 Cezannes, and a Renoir at the Dreams and Reality Exhibit. The paintings are on loan from the Orsay Museum, Paris. Better check out what's on at the National Museum when you arrive at Singapore. Directions: Walk along Bencoolen Street going towards Bras Basah road, cross Bras Basah Street and continue walking along Bencoolen Street until you arrive at Fort Canning Road. Cross Fort Canning Road and walk towards the entrance of the National Museum. Orchard Road: after exiting the hotel entrance, you turn right and walk along Bencoolen Street till you reach Bras Basah road. When you reach Bras Basah Road, turn right. Walk along Bras Basah until you reach Orchard Road. See the map above. Bugis Junction: after exiting from the hotel entrance, walk along Bencoolen Street till you reach Bras Basah road. When you reach Bras Basah road, turn left and walk along Bras Basah Road till you reach Victoria Street. When you reach Victoria Street, turn left and walk along Victoria Street till you reach Bugis. See map above. Arab Street: from Bugis, a little walk further and you reach Arab Street. See map above. Raffles Hotel: after exiting from the hotel entrance, walk along Bencoolen Street till you reach Bras Basah road. When you reach Bras Basah road, turn left and walk along Bras Basah Road till you reach Beach Road. Turn left at Beach Road. See map above. Raffles City: after exiting from the hotel entrance, walk along Bencoolen Street till you reach Bras Basah road. When you reach Bras Basah road, turn left and walk along Bras Basah Road till you reach North Bridge Road. See map above. Merlion: not really walking distance from the Merlion but the bus that goes straight to the Merlion can be taken at the bus stop near Kopitiam. Bus 131 goes straight to Fullerton where you can walk to go to the Merlion. All room rates include government taxes and complimentary breakfast. To change your room bookings or to make a cancellation, you need to inform them 2 weeks 72 hours before arrival. For cancellation less than 72 hours before arrival, they will charge you 1 day room rate. There is no downpayment but they require a credit card guarantee to confirm the booking. You need to make a downpayment when you arrive at the hotel to check-in. My tip: Pay for your hotel room in full upon check-in so you don't carry a lot of cash with you while sightseeing. The family room is spacious, has a high ceiling, with a lot of closet space. Even if you fill the maximum capacity of 7 people in a family room, the room has still enough space for everyone to comfortably move around. Toilet and bath are separate, which means they have separate doors. 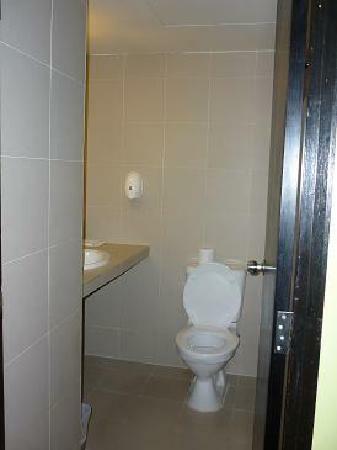 Even if you have 7 people in a room, they won't have problems using the toilet. One can use the toilet while another uses the bath. This is a very smart move of the hotel to separate these two. The beds are full sized mattresses, even the roll away beds. For a family room for 6, we were given 2 queen sized beds and 2 single beds. You are given breakfast coupons which you claim at the reception everyday, on the day before breakfast is to be served. 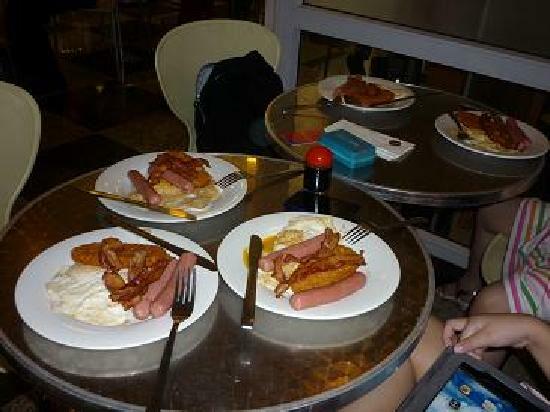 The complimentary breakfast consist of a set meal of 2 hotdogs, 2 slices of bacon, scrambled eggs/2 fried eggs. Then in addition there is a buffet spread of pancakes/french toast, noodles (pad thai or chinese pancit), cereal, toast and jam/marmalade/butter, coffee, tea, juice, water. The room amenities includes free wifi (with super fast connection speed), 29 inch flat screen cable TV, coffee and tea making facilities (consisting of an electric kettle, cofee and milk tea), mini ref, in room safe, telephone, free slippers, free toothbrush and toothpaste. The service at reception and housekeeping is fast and efficient. We asked for a travel adaptor, hair dryer, extra pillows, and tube ice. Our room was cleaned everyday with fresh linen and towels. 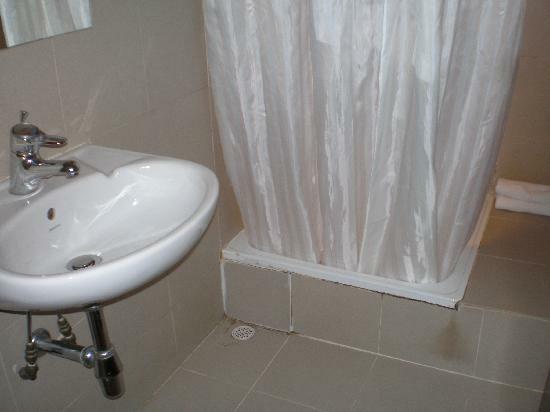 Housekeeping was very fast in addressing a minor toilet problem when we called them. The reception was very helpful in breaking our money into small bills. My conclusion: We will definitely stay at this hotel again and will highly recommend it to friends and relatives. Very useful post! Thanks for this! Glad to find yr blog a few months before our first trip to Singapore. We're a family of 5 incl. 75-year-old mother, finally stayed at this hotel for 2 days in beg Nov. Before we felt desperate to find a hotel for 5 in 1 room w/in our budget. Most hotels are good for max. 3, and it means we have to book 2 rooms. Thanks again! I know exactly what you mean. I usually have the same problem. Keep reading my blog. My posts are usually focused on finding good deals for a family of 6. Like my facebook page (http://www.facebook.com/pinoyroadtrip) so you can get updates. Thanks for letting me know my post was helpful. hi! thank you for taking time with this review.We are a family of four (2adults-2kids) and i am convince to stay @ strand... one thing i would like to know if they offer tour for Legoland in malaysia? and tickets for the Universal studios? thanks a lot! THANKS FOR THIS! We're a family of 5 and I have been going insane looking for a family room in SG. Thank you! Hi. I don't usually get my park tickets from the hotel but youu can email them at reservations@strandhotel.com.s and inquire. Regarding universal studios, it's best to get the tickets online if you're definite about the date of your visit. They give 10% discount for online purchase. (1) Is Bencoolen a more strategic location than Lavender St.? (2) Are there buses to/from Changi Airport that will pass near Strand Hotel? If yes, do you recommend those for a family of 5? (Or is the MRT better)? Yes, I think Bencoolen Street where Strand is located is better than Lavender for the reasons I enumerated above. Anywhere in Singapore is ok to stay in as long as you're near the MRT. But if I were to choose between the two and rates are almost the same, I'd prefer this area of Bencoolen Street. Thank you! Saw the post but it didn't mention buses. Does that mean it's not a recommended transpo option from Changi to Strand? Hi. I didn't consider using the bus because the walk from the the last bus stop at the Singapore Management University is around half a kilometer so I considered it too long a walk to undertake in hot and humid Singapore even if you only have carry on luggage. In any case, I updated the post on the link i gave you so you can study your bus options. It's great that you're asking all these questions. Happy reading! Hi! So happy to have stumbled upon your post. We're a family of five and I had trouble looking for rooms where all of us can be accommodated in one. One question though, is the complimentary breakfast for each of you or is it only limited to a number of people (say, only 2 people like most hotels)? If you book a double room, you get breakfast for 2. If you book a triple rm, you get breakfast for 3. If you book a family rm, whose min capacity is 4, you get breakfast for 4. The family rm has a max capacity of 7 persons. If you book a family rm for 4 and pay the additional charge for the 5th person, then you get breakfast for 5. There are cases when they don't assess an additional charge, such as when the additional person is a child 3yrs. and below. The child can stay for free in the rm but is not entitled to breakfast. You didn't include the price for the family room of 6. How much is it per day?? Thanks. The rate of S$240 for the family room is good for 4 persons. Additional charge beyond 4 people is S$40 per person. Therefore, If 6 persons will occupy the family room, your rate will be S$240 + S$40 + S$40 = S$320. Hi1 Thanks for the useful information. Can I ask if the hotel is strict regarding number of people. We are a group of 4, but for the first two nights another friend (total of 5)is staying along with us. we don't mind sharing a bed. Do you think it's possible to just get a room for 4? coz we're trying to fit it in our budget. Thanks! Hi. Based on Strand hotel's reply to my brother's inquiry regarding rates for 2 adults and 2 children, Strand hotel replied that they allow sharing of bed with children 9 years old and below. They charge by the number of persons in the room. Children 10 years old and above are considered adults and are charged per head. Hi! I'd like to ask if your family availed of the Hippo/Duck tour and what the experience was like? Will be travelling to SG soon with my elderly parents and we're considering the hop-on hop-off tours because of their limited mobility. Would you say it's worth it? Thanks in advance! I'm glad i stumbled upon your blog. May I ask if you also had to enter your credit card information when you inquired on the room availability? We are a group of 5 travelling this November. Hope to hear from you soon. Thanks! Yes, I did it twice and never encountered any problem afterwards. My brother and a couple of friends did it too and never reported to me that they encountered any problem after doing so. I just some questions. Im travelling with my parents (both senior citizen) this xmas and im planning to stay here. Do they have a lift? Or there are rooms at the first floor? I'm not sure if they have rooms on the first floor. But they have a lift so it's fine if you take the upper floors. I'll be travelling on December with my parents: my dad, a senior, and my mom who has a walking condition. Plus my nephews and sibs. Is the MRT near the Strand Hotel? Because my mom cannot walk that far. Do they offer wheelchair assistance? I know this is beyond accommodation or travel concern, but just in case you have an idea if the Strand Hotel offer such assistance. Thanks!